In the begining of a new year, it’s quite usual to do a endless list of things to change in your life. Almost without exception, We all think “This time it’s gonna be”, but in the end, we left the list behind after one month. Or maybe not! So we are making it easier and leave you with 6 new year resolutions suggestions for a more sustainable living that will be good for your wallet too. 1 – Reduce consume of plastic products and mainly single-use plastic. They are made from plastic and disposable. Needless to say anything else! We already told you about the dangers of using plastic here and here , and made you a list of plastic products that you should reduce or avoid it’s use. Tea is a drink that can be easily prepared with loose leaf, which apart from being more ecologic, some people find it more tasty. The tea bags only create needless waste and most part of them contains plastic, like polypropylene or Nylon fibers, to seal them together or made them more resistant. You can find more interesting information in this article from Treading My Own Path . Disposable blades and razors are made from cheap stainless steel and plastic and have a reduce lifetime. This require constant renovation and worst of all, most of them are not recyclable. We already told you about ecological detergents and the reasons you shouldn’t use traditional detergents. 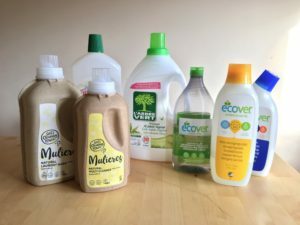 These contains harmful ingredients, so if you prefer to use ecological cleaning products, this will bring benefits not just for your health but for the planet. First of all the packaging and cuttlery from these pre-cut fruits and vegetable are made of plastic. The food are not so fresh, lose flavour and nutrients and are much more expensive than whole ones. Most part of regular cosmetics contains microbeads and other harmful ingredients that are not retained in water treatment systems, ending up in the oceans – can be consume by aquatic animals – and therefore in our plate. Adding to this, can contribute for accumulation of tartar on the teeth (in case of toothpaste) or harm your skin (in case of moisturizing creams).